The water's unique, high-velocity wave pattern create the feeling of more coverage. H2Okinetic showers look different because they are different. H2Okinetic Technology creates a shower experience like no other. 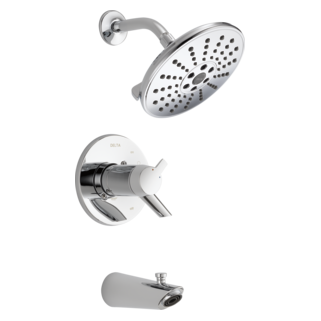 Each shower head and hand shower contains an internal system that controls the speed, movement and droplet size of the water, which creates the feeling of more water without using more water. So go ahead and indulge, because now you can save water while enjoying a warm, drenching shower experience. Another reason Delta is more than just a shower. Inside the shower head, water is channeled through a series of strategically placed, highly engineered chambers that create velocity and sculpt the water into a unique wave pattern that blankets the body with luxurious warmth. All this happens without any internal moving parts that could break or degrade over time. It’s the feeling of more water without using more. And it’s revolutionizing the way people think about showers. This shower/hand shower is great. The adjustable setting on the hand shower are nice and the pause option is great when giving the kids a bath. What is H2Okinetic Technology and how does it work? 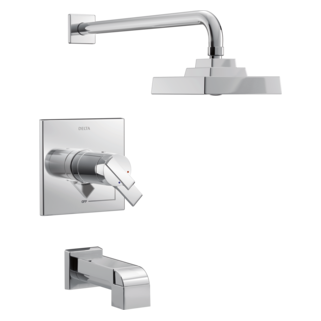 H2Okinetic Technology is Delta Faucet's proprietary method of utilizing the science of fluidics to deliver water in motion. It works by controlling the movement and droplet size of water, which creates the feeling of a high pressure shower experience. Are there moving parts inside the shower head that will wear out over time? Are there moving parts inside the shower head that will wear out over time? 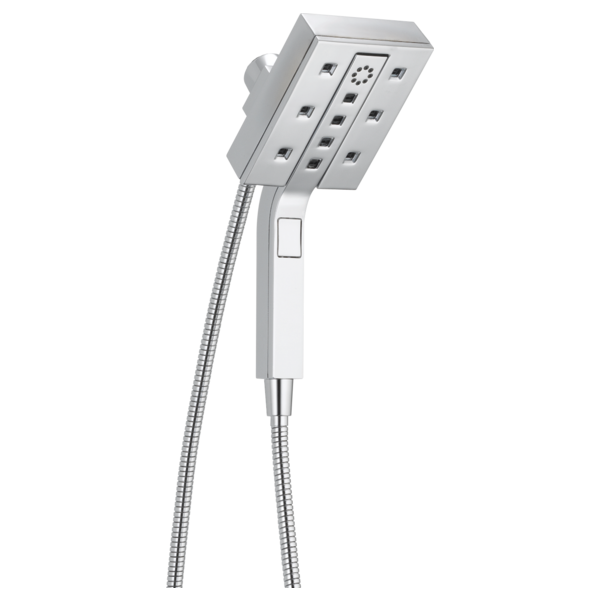 H2Okinetic shower heads use specially designed channels to control the water's movement without utilizing moving parts. 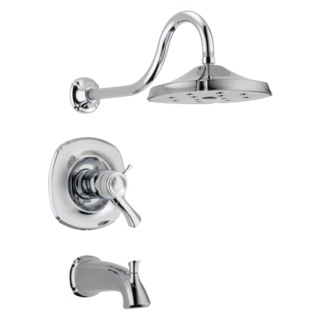 What is the difference between a standard shower head and an H2Okinetic shower head? 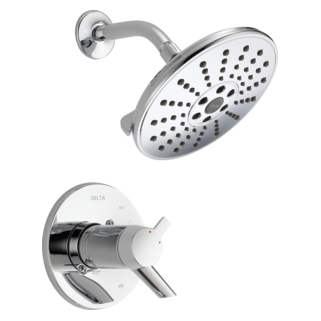 A standard shower head delivers water through spray holes in the faceplate as a stream. An H2Okinetic shower head uses the science of fluidics to control and design the feeling of the water. Water comes in the shower head, and H2Okinetic® Technology directs the water out as an oscillating stream to create a fan of water with larger droplets. Do H2Okinetic shower heads and hand held showers control the pressure of the water? No, H2Okinetic Technology controls the speed, movement and droplet size of the water from the shower head, which creates the feeling of more water than a standard shower flowing at the same rate. 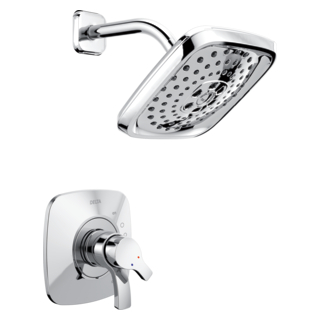 Why select an H2Okinetic water-efficient shower head? H2Okinetic shower heads offer the feeling of more water than a standard shower head flowing at the same rate, without sacrificing the shower experience. Will lime build-up clog my H2Okinetic shower head? Because the water oscillates as it leaves the spray hole, the H2Okinetic chip is self-cleaning and does not allow lime to build up over time.